My Grapher labels overlap! How can I fix this? 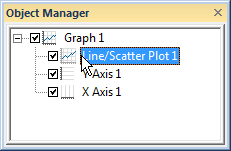 Click once on the plot, axis, legend, or graph in the Object Manager. Click the plot in the Object Manager. Click the Graph Tools | Plot Tools | Move Labels command. Click on the label to select it. Hold down the left mouse button and drag the label to the new desired location. Repeat for each additional label that should be moved. Press ESC on the keyboard or click Graph Tools | Plot Tools | Move Labels again when all labels are moved to the desired new location. If lines should be drawn from the label to the point, change the Label Leader Line properties on the Line tab in the Property Manager.